This book response first appeared as part of the series Bateson Book Forum: The Mushroom at the End of the World for the journal Cultural Anthropology. 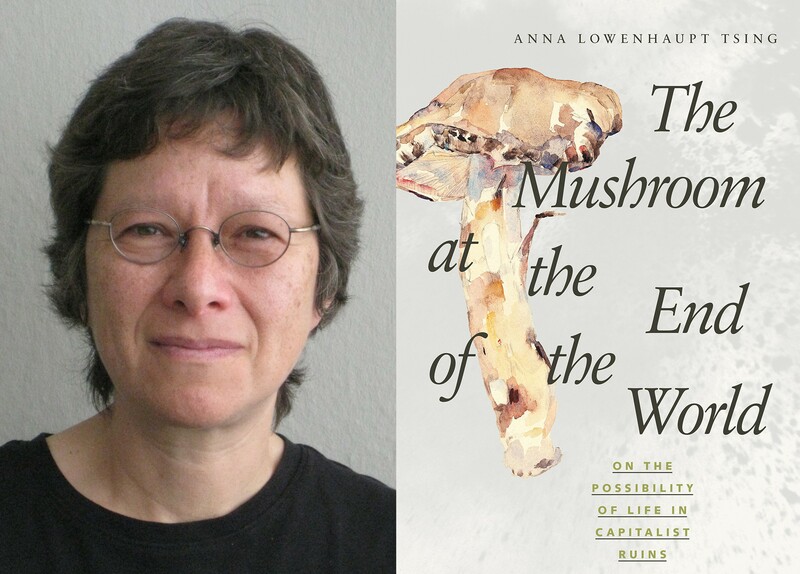 It is hard to know what to start thinking with in a book as rich with ideas as Anna Lowenhaupt Tsing’s The Mushroom at the End of the World. What struck me the most though, was a middle section on “Freedom . . .” Here and in the pages that surround it, Tsing writes that the way Southeast Asian refugee immigrants and white Vietnam War vets pick mushrooms in Oregon might be conceptualized as a practice of salvage accumulation. Tsing argues that such a practice produces sites of life that are “simultaneously inside and outside of capitalism” (Tsing 2015, 63). In these pericapitalist worlds, people produce irregular forms of freedom. Importantly, she notes, this is not the liberal freedom of rational individual choice; rather, it is a form of freedom haunted by forms of power “held in abeyance” (Tsing 2015, 76). When mushroom pickers in Oregon speak of freedom, they are speaking of freedom from the drudgery of wage labor, apartment life, property restrictions, and the violence of urban policing. The freedom of salvage accumulation thus becomes “both a way to move on and a way to remember” (Tsing 2015, 79). The freedom of the picker is the freedom to search where and when the picker wants; it is freedom from ownership and freedom from surveillance. 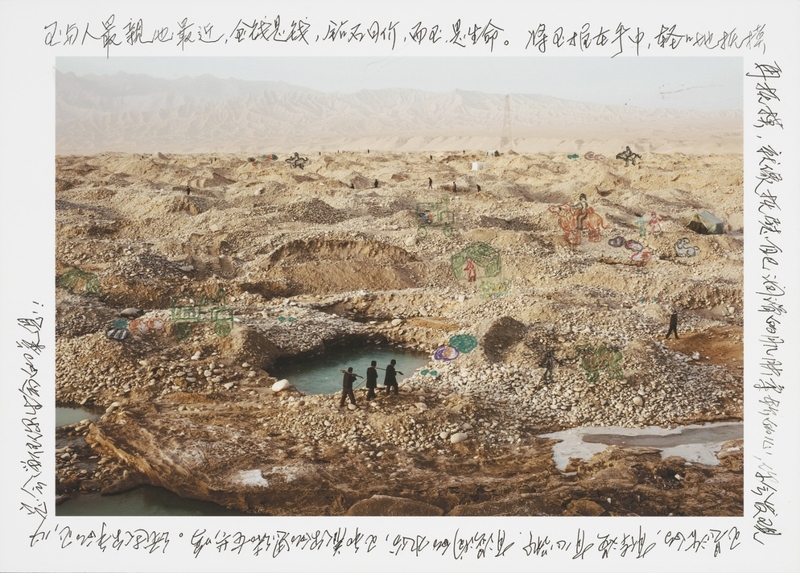 An image of the jade fields near Hotan, from Carolyn Drake’s art project Wild Pigeon. The image is inscribed and illustrated by a Han jade cutter: “Jade is a person’s best friend, that is how it has been up until now. And jade is life. If you hold jade in your hand, lightly, gently, touch it and stoke it, again and again. It is just like the soothing sensation you get from smooth skin or a soft heart. You will find that jade is alive. It has a body temperature, heartbeat, it contains nutrient-rich water. Jade can understand your heart and mind. The jade that you have held in your hands will retain a part of your soul, aren’t I right?” Image courtesy of Carolyn Drake. In a corner of China, several thousand kilometers from the Yunnan forests Tsing writes about in the second half of her book, I have lived with another group of pickers. They are Uyghurs who scavenge the dry river valleys near Yaken and Hotan on the border with Afghanistan for jade. Armed with hoes, these young Muslim men sort through rocks for months, avoiding the thousands of Han settlers and state-owned corporations that have come in the Jade Rush that has overtaken their homeland. After filling a fanny pack with stones they go to the city, dodging the many police checkpoints that stand between them and the regional capital Ürümchi. If they are seen by the police, they will be sent back or arrested. They will be caught up in the so-called People’s War on Terror, which targets young Uyghur men and thrives on indefinite detention and labor camps. Yet if these young men do manage to arrive in the city, they too, like the mushroom pickers, speak of a kind of freedom. Actually, I have to go back next week because I am being forced to go. The Yaken police have been calling me every day telling me that I must come back. They say that if I stay here, they will alert the Ürümchi police and have me arrested. I don’t have any choice. Lots of my friends have gone back to Yaken because the police told them to come, and now they don’t exist. I don’t know where they are. No one knows. They have disappeared. There is no freedom in this world. For Uyghurs, life is very difficult and we have no freedom. I don’t even know what I am accused of, but I must accept their judgment. I have no choice. Where there is no freedom there is tension (jiddiy weziyet); where there is tension there are incidents; where there are incidents there are police; where there are police there is no freedom. What is the freedom Hasen is describing here? How is it related to the various types of freedom that Tsing describes among the mushroom pickers in Open Ticket, Oregon? In other conversations, Hasen told me that he dreamed of traveling abroad, of seeing the world, but he knew that none of these things would happen. He has said that his smartphone offered him the freedom to know, to move and live as he felt he should as a Muslim. The WeChat app on his phone allowed him to teach Islam to others, which he felt was something that gave his life meaning. Unlike the mushroom pickers, Hasen’s freedom was not haunted by wage labor, for he had never had a job of that sort. For him, freedom was haunted by poverty and state violence. He was escaping the control of the police and finding an Islamic identity through the freedom that came from picking jade, peddling the stones to Han jewelers in the city and buying access to the Internet. As in Tsing’s case, Hasen’s was a kind of pericapitalist freedom, a means of escape and of remembering the dignity of autonomy. Hasen said that he had no long-term economic plan. He was trying to survive and maintain his Muslim identity. This was his only plan. Tsing (2015, 126) argues that what held the pickers together in Open Ticket, Oregon was “a spirit they called freedom.” Freedom from control was exchanged with advocates of market freedom. Freedom, in fact, was the value that was added through the exchange of mushrooms. Money and mushrooms were “parts of the freedom that pickers, buyers, and field agents treasure” (Tsing 2015, 127). Thinking about this reminds me of another site of salvage: trash pickers in the garbage dumps in Rio de Janeiro. Writing about these spaces, Kathleen Millar (2014, 35) argues that those who work in these spaces do so as a means of achieving a type of “relational autonomy.” This, like Tsing’s illiberal freedom, is not autonomy in the mode of individualist self-actualization. Rather, it is an autonomy premised on shared social belonging and interdependence. People work in these spaces sorting trash when they need to; they share resources when they do not. The freedom of this flexibility produces a politics that does not depend on a better tomorrow. Precarity is thus lived not solely as a condition of anxiety, but as a shared making-do. Perhaps it is not too bold to suggest that salvage freedom, as demonstrated by Uyghur jade pickers, Brazilian trash pickers, and Oregonian mushroom pickers, produces adaptive forms of relational autonomy. Are the freedoms we are talking about in these instances of informal labor, of picking through capitalist ruins, responses to shared or, at least, rhyming feelings of social precarity? Yes, I think so. But there is also a differential distribution of pain and belonging. The variegated effects of race, class, colonialism and citizenship are not erased by salvage freedom. Uyghur jade pickers who want to escape poverty and to belong to a global Muslim community despite a terrifying People’s War on Terror are not identical to Brazilian trash pickers who are detached from a better future. Moreover, the horizon of freedom for these two groups is not the same as that of white American Vietnam War vets or Southeast Asian refugee immigrants in Oregon. Yet, just as Tsing notes about the diversity of freedoms that coalesce in Open Ticket, I suggest that there is a shared spirit of pericapitalist freedom at work in each of these cases. Although they are attached to different political formations and felt with different levels of intensity, these freedoms rhyme with each other. In each case, we are seeing people finding ways to survive. Deleuze, Gilles, and Claire Parnet. 1987. Dialogues. Translated by Hugh Tomlinson and Barbara Habberjam. New York: Columbia University Press. Millar, Kathleen. 2014. “The Precarious Present: Wageless Labor and Disrupted Life in Rio de Janeiro, Brazil.” Cultural Anthropology 29, no. 1: 32–53.